Jazz sitting in the snow. (There is not currantly any snow on the ground now but it could snow anyday. 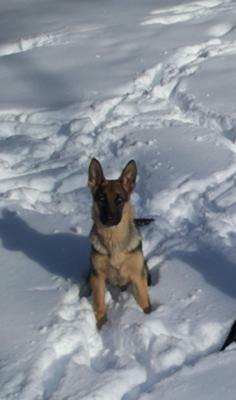 I have a purebred GSD puppy (5 months old) named Jazz. I just want to know what kind of work I could put my puppy to. I live in the suburbs with a medium-small backyard. I heard that GSDs have a natural need to work or they become restless and destructive. What work can I give a GSD in a small neighborhood? Also she has extremely high pain tolerance. I got this puppy from my dad because he had to get rid of it because of that pain tolerance. He uses an electric fence to keep his dogs from getting off his property. The way this works is the electric fence company installs a wire a foot underground then puts a collar on each dog. The collar will shock the dog after the dog steps outside of the fence. Jazz had 3 collars on her and she still stepped out of the wire fence. Her sister yelped after just one collar. Even the company owner said that after 13 years of work he has never seen such high pain tolerance. I'm not sure if this is important but would she be able to work harder? And what kind of work? Comments for What is good work to give to a purebred GSD? ...good suggestions and comments, especially about NOT leaving your dog outside. I can't imagine doing that. They crave being part of the family and I think it's cruel to leave him outside. Leaving any dog outside for that matter. Don't take "work" too literally. As long as my two GSDs have a glass door or window where they can lie down and look out they seem to think they are working. They watch the driveway or back porch a good part of the day and bark if anyone comes near. They do need mental stimulation because they are so smart. Your puppy sounds bored. Do you have children? How much reading/studying have you done about the breed? GSD's are the BEST BREED of dogs in the world, but are NOT for everyone. I currently have 2 shepherds, a 9 yr. old male, and a 1 yr. old female puppy. They are inside when we are inside. Our male has NEVER destroyed anything. He is training our female. He has helped us raise our children and has clearly known his jobs and has known of our appreciation and NEED for him. It is my opinion that you can NOT keep a gsd outside and expect for them to become a well-behaved dog. They are "companion" dogs. They attach themselves to their families and especially one person. Your dog needs to come in and become a part of your family "pack". Please read my other post regarding the question "How smart is my 5 year old German Shepherd?". Best of luck to you. You have just become the owner of one of God's greatest creations...a german shepherd. Read, read, read and spend a LOT of time with your dog. Give her lots of jobs to do. Let her know that you NEED her and rely on her. She will love you...gsd's have HUGE hearts and they love COMPLETELY. You will soon discover how blessed you are to "be owned" by one. proper DAILY physical exercise and mental stimulation is crucial. First thing, don't use an insecure fence to keep your dog secure! Without seeing your pups drives in person, it is hard to tell you which way to go....SAR, agility, therapy....but a working breed of dog MUST have a job or feel like it has a job. The simplest way to do this is train obedience and walk that dog in structured fashion with a back pack. All you need to do is put a couple of bottles of water in it and the minute that pack goes on, he will go into "work" mode after a time or two. Hope this helps.